The VHA EHR offers an important opportunity to improve outcomes for Veterans with SCI/D by improving identifcation of pressure ulcers and targeting prevention strategies. A recent study used information from the VHA EHR to develop risk models for identifying pressure ulcers among Veterans with SCI/D. This study found that by combining structured data with text-based data, researchers could improve pres­sure ulcer case identifcation in the research cohort. The VHA Spinal Cord Injury/Disorders (SCI/D) system of care consists of an integrated network of care providers based on the longstanding hub and spoke model, with the SCI/D Centers serving as the hub. Locally accessible SCI/D primary care is provided at select VHA facilities within specifed catchment areas, which then serve as the ‘spokes’ supporting the SCI/D system of care. Quality assurance studies have found that there are relatively few hospital-acquired pressure ulcers among Veterans in the VHA SCI/D system of care, yet pressure ulcers are still among the most significant complications suffered by Veterans with spinal cord injuries, resulting in lower quality of life and increased cost of care. Across VHA, clinicians employ the Braden Scale to measure risk and make decisions about pressure ulcer prevention efforts in both the inpatient and outpatient setting. While the Braden Scale is the most widely used pressure ulcer risk assessment tool in the United States, researchers originally devised the scale for nursing home populations, so it may not adequately measure risk in Veterans with SCI/D, particularly those living in the community. Information stored in the VHA electronic health record (EHR) offers an important opportunity to target prevention strategies and improve outcomes for these high-risk Veterans by developing improved risk models that combine longitudinal data from multiple facilities. A recent study undertaken by researchers at the James A. Haley Veterans Hospital in Tampa sought to capture this opportunity by using information from the VHA EHR to develop improved risk models and assessment tools for pressure ulcers in Veterans with SCI/D. In consultation with an expert panel and VHA SCI/D leadership, Tampa investigators are targeting these new models to serve community dwelling Veterans. The study identifed potential risk factors through a literature review that was supplemented with expert panel discussion and review. The study examined nearly 100 potential risk factors, including patient demographics, co-morbidities, severity of injury, living situation, and travel distance to an SCI Center. We employed both traditional methods based on structured data (ICD-9-CM, etc. ), combined with text extraction and classifcation techniques. The study fndings serve as an example of how combining text with structured data can improve identifcation of pressure ulcers. Employing a fve-year (FY 2009-2013) longitudinal retrospective cohort design, we obtained data from the VHA national EHR including both structured (i.e., coded in database or table) and narrative (i.e., text in clinical notes) data. In our analysis of structured data, we examined over one million records of inpatient and outpatient care in the VHA, care paid for in the community by VA, medication and laboratory data, and information about equipment provided by VA. We analyzed all inpatient and outpatient clinical text (over nine million records), employing two distinct text-based techniques to identify pressure ulcers. We used both top down, rule-based, natural language processing (NLP), and bottom up, machine learning, statistical text mining (STM). Veterans who had at least one Comprehensive Preventive Health Evaluation in the study period. The SCI/D Centers are required to offer the preventive health exam annually. While Veterans may or may not take advantage of the service, when they do, it represents an opportunity for clinicians to identify risk early. The frst annual exam completed by our cohort Veterans during the study period became a reference point for the analysis, with risk factors identifed in the year before the exam, and the frst recorded pressure ulcer within one year after the exam treated as an incident case. Findings from our research illustrate how combining structured data and text-based data can improve pressure ulcer case identifcation, a crucial component of the study. A total of 15,819 Veterans were seen at the VHA SCI/D System of Care in FY 2009. Of these, we excluded Veterans if they had MS/ ALS (n = 2,114), a pressure ulcer in 2008 or before their frst preventive exam (n = 4,715), or if they did not have an annual exam in the fve-year study period (n = 3,740). The remaining study cohort (n = 5,250) participants were predominantly male (97 percent), white (70 percent), with a mean age of 57. Most Veterans (70 percent) lived with nuclear or extended family, a caregiver or roommate (70 percent), while 26 percent lived alone. We selected a stratifed sample of 1,233 text documents from across study facilities. Clinical annotators then reviewed the text documents, and a clinical expert adjudicated them in order to create a reference standard for NLP/STM analysis. 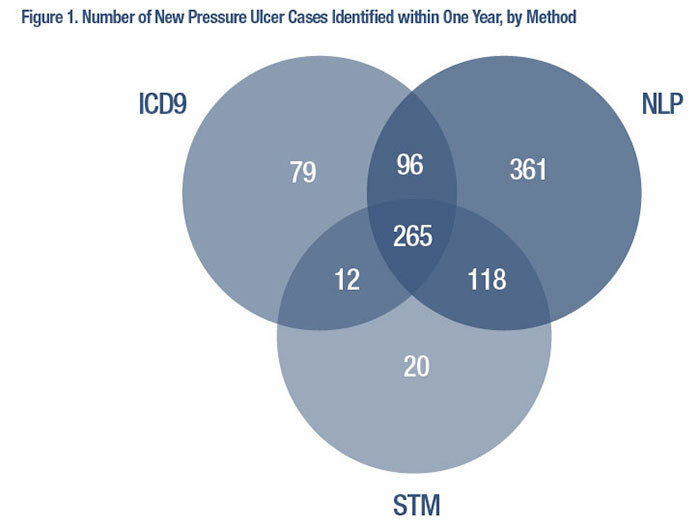 Using structured (inpatient and outpatient ICD-9-CM codes) data alone, we found the incidence of pressure ulcers at three, six, and twelve months to be 4.3 percent, 6.3 percent, and 8.6 percent. When we combined structured and text data, we found the incidence more than doubled to 9.9 percent, 12.8 percent, and 18.1 percent at three, six, and twelve months, respectively. These results suggest that ICD-9-CM data alone underestimate the incidence of pressure ulcers. Our fnding supports the concerns expressed during the expert panel discussions. We improved the identifcation of incident pressure ulcers by combining traditional ICD­9-CM with two text analysis techniques. Figure 1 presents a Venn diagram of results for each method at one year. While we found signifcant overlap, each method identifed unique cases. NLP contributed the greatest number of unique cases (n = 361) followed by ICD-9-CM (79) and STM (n = 20). NLP requires much more effort to complete chart review and in the programming of rules but provides more specifc information for subsequent analysis. STM requires simple labeling of documents as case/not case and can be very effective depending on the task. Combining the techniques can maximize results when studying complex clinical problems in big data. HSR&D has made signifcant investment in infrastructure to enable researchers to access text-based data to supplement traditional secondary data resources. Leveraging the resource of text-based data and analytic environment allowed us to better describe the incidence of pressure ulcers among Veterans with SCI/D. Wilchesky M, Lungu O. “Predictive and Concurrent Validity of the Braden Scale in Long-term Care: A Meta-analysis,” Wound Repair and Regeneration 2015; 23(1):44-56. VA HSR&D IIR 12-064 Leveraging Information in the EHR to Measure Pressure Ulcer Risk in Veterans with SCI.